Field Pack, or buttpack, is a kind of equipment for soldiers carrying small amount of supplies, it has a long history in military use. If the supplies are too big for pockets of the clothes, and they are not enough to fill half the capacity of a backpack, buttpack is the perfect choice. This blog is about the story of GI Field Packs, or more precisely, the story about the field pack of the Vietnam War. Copy Rights Reserved. Reproduction or republication with no permission is not allowed. Although there have been similar functions such as M-1936 Musette Bag, the widely use of field pack was started from post Korean War with M-1956 Load-Carrying Equipment. The set of M-1956 was originally set up with a square field bag, which was the M-1956 Field Pack (Field Pack, Combat, M-1956). At that time, the backpack type of fittings for soldiers for using is very limited: the World War II M-1936 Musette Bag has basically no longer use.The M-1945 pack system which issued at the end of World War II is rarely used at the end of the Korean War. While the mountain rucksacks only issued to the 10th Mountain Division, not ordinary infantries. As a result, most soldiers carry supplies mainly by using the Field Packs. When M-1956 still named as EX-54 during its test, once there was a prototype that close to the M-1945 Cargo pack which has a large size field pocket scheme, but in the end it was changed into small one as the Field Pack as we see today. The most notable features of field packs in this period is the eyelets on the side of the flap, although there is no conclusive evidence, but I think this design is the evolution from the late M-1936 musette bag. But after the M-1956 field pack issued, soon they found it was too small, so five years later, there is a larger field pack named “M-1961 field pack” (Field Pack, Combat, M-1961) as a substitute for M-1956 field pack. The early version of M-1961 field pack was still named “M-1956” in its stamp, but its FSN has updated. The design of the M-1961 Field Pack has become a classic one. Its characteristics include the trapezoidal flap, webbing handle, tornado collar and a big compartment, mount webbing on both sides, and two binding straps on the bottom. Not only did the United States follow up the base version of the field packs, but it also affected the military equipment of many other countries. As one of the results of the war, many M-1961 field packs were produced during the Vietnam War, which later became inventory. Even with the new nylon field pack became standard issue in 1976, the canvas M-1961 continued to be used in the army for many years. After the U. S. troops intervened in Vietnam, US Army soon found that the canvas webbing was not suitable for the jungle environment in Vietnam and began to seek new equipment. But I believe that all of you readers are tired of listening to this history, so here we focus on the field pack part. In fact, long before the United States formally launched the army in Vietnam in 1965, US Army started a research on lightweight nylon webbing using in tropical environment. In 1962, the Natick Laboratory produced few sets of nylon webbing for conception evaluating, they were based on the M-1956 LCE. And in 1967, 550 sets was produced for further test. But “550” is not a big number for an Army, almost every set of them were depleted or worn out in the field test, and very few data or production left. The point is: this nylon version M-1956 LCE INCLUDED a nylon field pack. The only nylon M-1956 LLCE data can be found in the Internet, including M-14 magazine pouches, and M-1943/M-1951 intrenching tool carrier. M-1967 LLCE engineering sample (NATICK). You can clearly see the nylon field pack on the model’s back (NATICK). Those nylon M-1956 LCE later evolved into M-1967 LLCE (Lightweight Load-Carrying Equipment, not MLCE / “Modernized Load-Carrying Equipment”). As we all know, during the Vietnam War, all the nylon equipment specially supplied the Vietnam, and did not distribute the units in other areas. The army’s M-1967 was formally issued in 1968, but nylon field pack was not included. What happened? The answer is in the report. This report was sent by ACTIV (Army Conception Team In Vietnam) on January 24th, 1968 to the U.S. Army Pacific Command, the content is reported that US Army Vietnam (USARV) no longer needs field pack (Field Pack, Combat) and intrenching tool carrier (Carrier, Intrenching Tool). a. Action has been taken under ENSURE 106 to procure 120,500 Lightweight Nylon rucksack for issue to combat/combat support units in Vietnam. This new rucksack will be issued initially as a replacement for the standard rucksack and the standard Field Pack, Combat. The combat/combat support units in Vietnam will not require the Nylon Lightweight Field Pack, Combat. a. The Nylon Lightweight Field Pack, Combat, not to be procured for issue to combat/combat support units in Vietnam. As we all know, the lightweight rucksack will cover the soldiers’ whole back from the shoulder to the waist, which itself is also a kind of backpack equipment, the capacity is about three times bigger than field pack. So lightweight rucksack is completely covering the field packs, but larger capacity and more useful though. So USARV used lightweight nylon rucksacks instead of field packs was a reasonable thing. Do you remember the theory mention before? During the Vietnam War, nylon webbing were only made for Vietnam. So once a nylon equipment is no longer needed by USARV (and any units in the Vietnam), it will not be produced. This explains why there was no nylon field pack in the army’s M-1967 LLCE equipment. Of course, although there was no need to production nylon field pack because there was no need for USARV, there must exist some for test or engineering sample. There is a saying that this version of the nylon field bag produced only 500, which may be based on the production of nylon M-1956. The following photos are the suspected nylon version of the M-1956 / M-1967 nylon field pack. By the way, the report said intrenching tool carrier was no longer needed, because in 1968, a new full-metal tri-folded intrenching tool was isseud, instead of the old M-1943 and M-1951 intrenching tool at the beginning of the year, and ready to start to a mass production instead of the old ones. And the “Lightweight Carrier, Intrenching Tool” mentioned in the report refers to the carrier for the old intrenching tool. As soon as the new intrenching tools are going to be issued, it is no longer necessary to supplement the carrier of the old. Here, some one may ask that since you said that the M-1967 nylon field pack does not exist at first. So, what is the popular “M-1967 nylon buttpack” that every Vietnam War militaria collectors are pursuing now? Don’t worry, the answer to this question is even more simple. The truth is in the stamp of “M-1967 nylon field pack” you said. This indicates that this LCE is totally different from the Army’s M-1967 LLCE, but the M-1967 USMC of the Marines. This is another long story. The M-1967 USMC field has a pair of straps with snaps on the back. During the Army’s research and testing of lightweight nylon webbing, the Marines was actually doing the same thing. And in a sense, the Marines was facing a even more serious situation than the Army. M-1961 webbing is actually the continuation of M-1936 LCE during World War II, and has lagged behind the times. and the old M-1941 backpack sets were still in use. In 1964, the Marines tested a backpack set called XM1964, which is a small Nylon Backpack with two sub pockets. The brightest feature of XM1964 were the Davies quick release buckles on the shoulder straps. In form, XM1964 is still a continuation of the idea of the M-1941 backpack: the backpack shaped in small lateral rectangle with a high back position, leaving room for knapsack or field pack on the back waist. M-1967 USMC is the finalized product of XM1964. It has four components: a backpack, a field pack, a pair of suspenders with quick release feature and two M-14 nylon magazine pouches. The backpack’ quick release shoulder straps of XM1964 are separated into two pieces: pack main body and quick release suspenders. The M-1967 USMC field pack still uses the idea of the M-1941 backpack set, which is made up of the upper and lower parts: the backpack (haversack) is on the upper half of the back, and the field pack (knapsack) is in the lower waist. And this is actually reflected in the name of the harness. The M-1967 USMC’s field pack is called “Field Pack, Cargo; Nylon; (M-1967 USMC)“, and the name of the field pack for the M-1941 set group is also the “Field Pack, Cargo“. But the difference is that according to the design of M-1967 USMC, the backpack and the field pack can be used alone, while the M-1941 knapsack must be used with the haversack. Unfortunately, even the M-1967 USMC was a bit earlier than the Army’s M-1967 LLCE on the assignment date, the M-1967 USMC was actually issued much more later. From the data I collected so far, the contract numbers of the M-1967 USMC were all 1970 dated. Considering the production and transportation period, the delivery will be at least six months later. However, the US Military began to withdraw from Vietnam in the summer of 1969. So, the design for the Vietnam War is almost useless, and the actual use of photos is few. That’s why M-1967 USMC is so rare now. 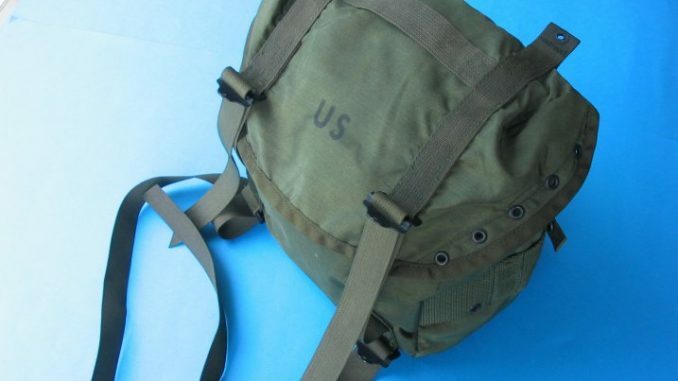 Many Vietnam War militaria collectors regard the M-1967 USMC Cargo Pack (field pack / buttpack) as a part of the Army’s M-1967 LLCE, and more people even simply think all nylon gears during the Vietnam War are “M-1967”, which is totally wrong. Tell a story I heard from the USMF, not guaranteed 100% true. It said that before 1990, M-1967 LLCE was very precious and hard to find in the militaria market, and most of the them were in bad shape, because the only source were the veterans who issued one in the South Asia. It was said that in the militaria market, M-1967 LLCE suspenders were at a price of $100 (and it was in bad shape since the hard field use) at that time. However, M-1967 LLCE is, after all, a mass-produced equipment in wartime, not trial or experimental items. It is destined that her production is absolutely indispensable. One day in 1990, several containers were found in a military warehouse, they were all filled with brand new M-1967 LLCE gears . They were produced for the war but never shipped. It is said that the price of suspenders dropped to 1 dollar per set instantly. The story of field pack is not over yet. The Vietnam War was only in the first half. Now let’s talk about the second half. In 1974, the famous ALICE started it’s service, insteading of the M-1956 and M-1967, and became the standard equipment for all of the US Military personal. But the soon they found a problem: the two rucksacks of the ALICE were too big for daily training and duties, and even the smaller one (medium rucksack) has a huge volume of 50L, did not cover the demand for carrying small amount of supplies. In fact, the small rucksack during ALICE test was able to meet this demand, but it was deleted before it was finalized. When the military reusing the M-1961 canvas field pack covering the demand of the basic units, they was also considering the new nylon field pack for ALICE. Then they suddenly remembered that there WAS such a thing already: The M-1967 LLCE field pack that was abandoned by the USARV. The army returned to the design of the M-1967 field pack, which was restarted in 1976. This is called Field Pack, Training (NSN: 8465-00-936-6825), which is commonly known as “ALICE buttpack”. The D-rings replaced hanging eyelet tabs. Some people (like me, a nylon nerd) may notice that the assignment date of NSN for training field packs is July 1, 1968 — the date of assignment of many other M-1967 LLCE components. This also explains from another point of view that this field pack was originally actually a part of M-1967 LLCE, but was later reenabled and given a new name. If you are lucky enough to get a brand-new training field pack, you will find that it has a separate instruction sheet. In some versions of the batch of training field packs, the stamp even keep the words like “M-1967”. All the signs indicate that this thing, which is often called the “ALICE buttpack”, is not a part of ALICE, it is a separated equipment. After the Millennium, the training field pack was modified to IIFS (TLBV) style and became easier to use, but the name and NSN remain unchanged. This is the last version of their kind.